Ribbed stitches were originally created for clothing hems and cuffs to provide a tailored, snug fit that doesn’t curl on the edges and provides some “give”. Using ribs in hats allows a broader range of fit – the bigger your head, the more stretch. 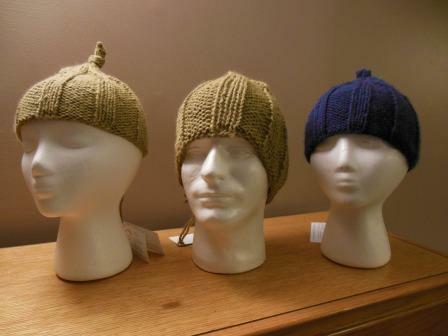 These hats unstretched appear to be made for gnomes – or anything with a skinny, pointed head! The ribbing provides a custom fit. Gnome or not, the 3-ply bulky alpaca yarn is super soft and super warm, with just a touch of wool to provide some “memory” or elasticity. This yarn is also the base yarn in some of our “Magic Scarves”, so the hats can accompany (or not!) the scarves. The “pumpkin vine” top is made by just continuing to knit 3 to 5 stitches until it is long enough to tie a knot – I think it looks like a pig’s tail! 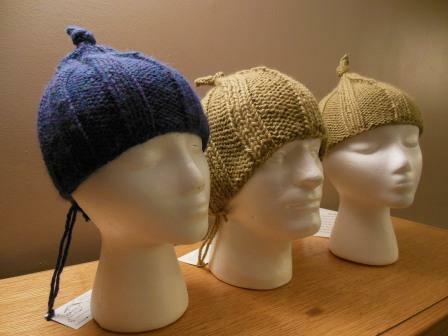 I am making some other colors of the Rib hat and will probably make some more of these basic but fun ribbed hats in other yarns too. 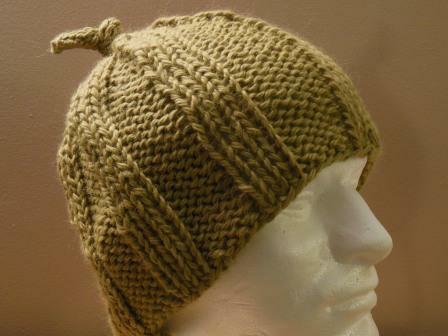 This entry was posted in fiber art and tagged cuffs, hats, knit hats, knitting, ribbed hats. Bookmark the permalink. I love your knitting colors! Do you think that Knitting Is More than an Art, It Is a Cause? We could use these in WY today! brrrrrrrrrrrrr..